"SENSOrimotor structuring of Perception and Action for emergent Cognition"
SENSOPAC stands for "SENSOrimotor structuring of Perception and Action for emergent Cognition". The project combines machine learning techniques and knowledge about biological perception-action mechanisms. SENSOPAC has developed a cerebellum-based control system to solve complex haptic/touch problems using active sensing. SENSOPAC was funded under the EU Framework 6 IST Cognitive Systems Initiative. It took 4.5 years from January 1st, 2006 and its 12 participants came from 9 different countries. The neuroscience part of SENSOPAC targeted a goal that has previously been regarded as unattainable, viz. 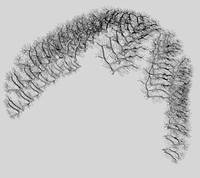 an executable, biomimetic model of a full functional system of the brain. Because of the overall goal of the SENSOPAC project to generate systems for haptic discrimination, the focus of the neuroscience modelling was the cerebellar C3 zone-anterior interposed system, which is involved in arm-hand control and has an extremely rich representation of skin sensory input from the fingers. A complete biomimetic model requires knowledge at a wide range of levels, ranging from ion channels, synaptic learning mechanisms to local network connectivity and overall structural organization of input-output connections. All these levels of experimental analysis have been targeted within this project, in many cases with new state-of-the-art techniques developed within the project. The specific issues addressed by the experimentalists have been critical remaining gaps in our understanding of conductance level function and learning mechanisms of the cerebellar neuronal circuitry in general as well as specific aspects of in vivo local network connectivity and overall system function of the targeted subsystem. The result of the neuroscience work within the SENSOPAC project was successful in that a biomimetic model of the C3 zone-anterior interposed system, taking into account all aspects of neuronal and neuronal network function down to the contribution of specific types of ion channels, was accomplished. The Large-Scale Analog Model LSAM features the full model system, which within the SENSOPAC project was used to directly control the DLR robotic system in real-time, and was implemented at the neuronal/neuron bundle level of abstraction. The Event-Driven LookUp Table EDLUT model, featuring simulation of spiking neuronal networks, could be used to simulate parts of the system at a higher level of resolution, for corroborating the function of LSAM down to the conductance level. LSAM connected to the DLR robot provided as output haptics related, integrated sensorimotor signals, which could be extended also to signals related to 'imagination' of objects/properties. In this way, the neuroscience part of SENSOPAC showed that signal processing of the type that naturally occurs within the brain can be highly useful for the design of haptically competent cognitive systems. We examined active sensing, that is how information can be derived using haptic sensors (touch) in both human and robotic interfaces. The work in humans involved collecting and analysing microneurography (recording of nerve cells) data from humans to understand the fundamental principles involved in haptic sensing. Some notable successes were in the study of a new class of sensory receptors in humans that are based in the fingertip nail wall. We found that they responded reliably to forces applied to the fingertips representative for those that occur in object manipulation and exploration tasks. 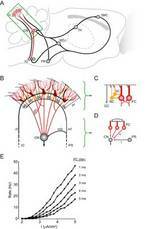 Furthermore, signals in populations of the neurons contain directional information about fingertip forces. That is, force direction reliably influenced the responses in nearly all the afferents and the preferred direction to tangential force components was distributed in all angular directions across afferents. We conclude that signals in the population of receptors contain vectorial information about fingertip forces and signal tactile features of contacted surfaces while being less influenced by textural information. Linked to these human studies were a range of computational studies that elucidated how the brain could decode spatiotemporal (spiking) data from the receptors for discrimination. We concluded that stimulus history affects both spike counts and first spike latencies. Some afferents even transmit high information about stimulation in their first spike latencies. An analysis of latency tuning curves confirms that those afferents respond to past stimulation only, independently of current ongoing stimulation. In addition a new type of artificial haptic sensor has been developed. An important result of SENSOPAC was the transfer of the neuroscience and haptic results to robotic systems. To this end, a novel, variable-impedance robotic hand-arm-hand system was developed for integration within the project. This DLR Hand-Arm System is a robotic system mimicking the kinematic, dynamic and force properties of the human arm using modern mechatronic technologies. It is based on a variable stiffness drive concept with joint structures as close to the biological counterpart as possible. The system is designed as a fully integrated hand-arm system that no longer allows the isolated use of the hand or arm. Nevertheless it still can be logically divided into a forearm and hand, including the wrist, on one side, and the arm consisting of a 3-DoF shoulder and a 2-DoF elbow, on the other. The requirements of the hand and arm are quite different. For example, vibration damping is of no relevance for the fingers (finger dynamics are negligible in relation to the applied forces), whereas a good vibration damping performance of the arm, especially in the shoulder, is crucial for the whole hand-arm system. Therefore the design aspects must be separately analysed for both systems. Compliance to cerebellar control was a key aspect in this system, for instance with respect to the hand kinematics. Within SENSOPAC, a detailed model of the human hand has been realised and results thereof integrated in the robotic system.